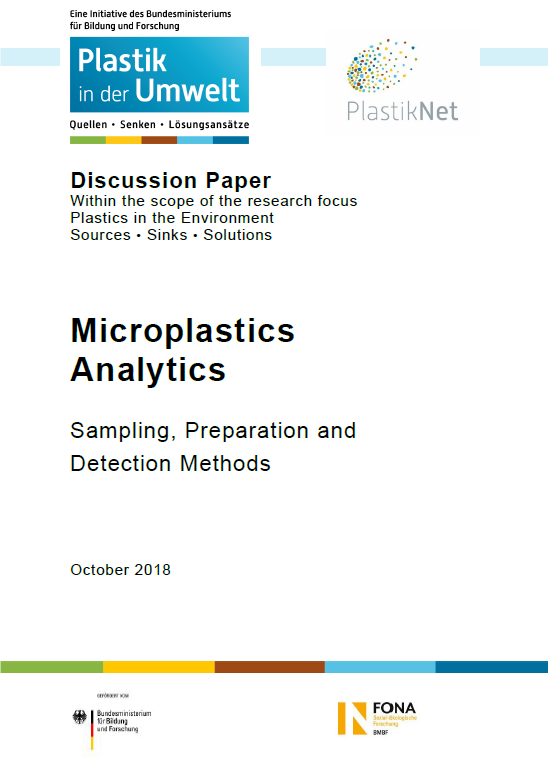 The discussion paper "Microplastics Analytics" is one of the first published, cross-project results of the research focus "Plastics in the Environment". This discussion paper, edited by Ecologic Institute, presents the physicochemical investigation methods used in the research focus "Plastics in the Environment", in particular for the analysis of microplastics. Therefore, representatives of the joint research projects discussed methods and analytical approaches to identify validated methods and comparable results in the various projects. The discussion paper reflects the current state the debate within the research focus. It contributes to a pool of methods that are as standardised as possible for the relevant application fields in science, industry, and administration and is available for download. Work on the discussion paper is to be continued in the further course of the research focus. In addition, the findings are to be incorporated into national and international standardization efforts (ISO / CEN / DIN standard). Eleven joint research projects, as well as representatives of some external projects, were involved in the preparation of the discussion paper. The discussion paper was developed under the crosscutting issue "Methods for sampling, sample preparation, and analysis (incl. reference materials)" of the research focus "Plastics in the Environment – Sources • Sinks • Solutions" and is available for Download [pdf, 560 kB, English]. Website of the research focus "Plastics in the Environment – Sources • Sinks • Solutions"
Braun, Ulrike; Jekel, Martin; Gerdts, Gunnar; Ivleva, Natalia; Reiber, Jens (2018): Discussion Paper Microplastics Analytics. Sampling, Preparation and Detection Methods. Discussion paper published in the course of the research focus "Plastics in the Environment – Sources • Sinks • Solutions". Berlin: Ecologic Institute.